Six of Australia’s leading travel influencers will put their experience in the hands of their audience via South African Tourism’s “Choose Your Adventure” Campaign. South African Tourism and G Adventures have partnered to send six of Australia’s favourite social-media influencers on a Choose Your Own ‘G’ Adventures trip of a lifetime to South Africa. Tailored to highlight the country’s reputation as an adventure playground, each influencer gives their audience complete control of what they get up to in the Rainbow Nation. Using Instagram Polls, followers will have the power to vote on the exhilarating activity they most want them to participate in and by the next day, the influencers will find themselves at their next location, ready to take on the chosen activity. The well-known influencers (pictured below) have a combined following of over 900,000 and include Brinkley Davies, Jorden Tually, ‘Polkadot Passport’ (featured image), Melissa Findley and ‘KoTravellers’ Kate and Oliver, as well as Oliver’s own channel ‘fathomlesslife’. Through G Adventures and their ethos for embracing authentic travel experiences, the team of six will travel from Durban to Cape Town, camping at incredible locations such as Chintsa and Storms River along the way. At each destination, it is their audience that will decide what they do. From bungee jumping to kayaking, each activity undertaken will be in the hands of the public. The troop will also visit the !Khwa ttu San Cultural Centre where they will take part in an immersive educational experience at the centre. During the visit, the influencers will have the opportunity to learn about the San culture* and language, and how it is being preserved in a progressively westernised world. !Khwa ttu San Cultural Centre is a ‘G for Good’ project, supported by their non-profit partner Planeterra. South African Tourism has also appointed content creator, Sam Earp to accompany the travellers to document every step of the journey. South African Tourism’s hub head for Australasia, Mosilo Sofonia said: “We’re so excited about this unique partnership whereby the itinerary for our fantastic group of influencers is in the hands of their audience whilst embracing all that a G Adventures tour has to offer. “Through this campaign, we hope to bring to life a different side of South Africa and highlight that it’s a destination like no other, with an abundance of unforgettable experiences to choose from. 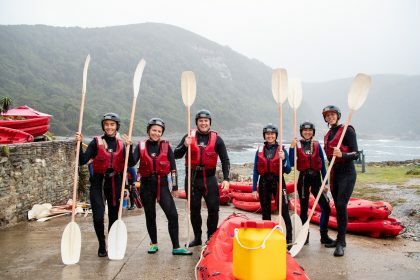 G Adventures director of marketing for ANZ, Louise Laing said: “We’re excited to try something new and adventurous with this partnership, and it gives us the perfect opportunity to show Aussies and New Zealanders the epic adventures you have when you travel with us. “More and more, we’re finding travellers are searching for the security and comfort of a small group tour, but the freedom and flexibility to make the experience their own. “More than ever, our world deserves more Aussies flexing their adventurous spirit.